The flight eventually left some 45 minutes late, but while I was asleep, just waking up for food & drinks, we had made up enough time to arrive ahead of schedule, until we hit Heathrow airspace where we were told there was an (air) traffic jam, so that we ended up being some 15 minutes late arriving. As I had checked in my luggage (15.7 kg including souvenirs as opposed to just 11.6 kg on the LHR – MEX flight!) relatively early in Mexico City, it seemed fair that the First In – Last Out system appeared to be in use – well not really last, but there were only some half a dozen folk waiting when my bag rolled onto the belt. I had asked Angie to bring a camera for the usual image of me emerging through the Arrival Gate for the usual ‘last image of the trip’ shot, but was sad that there was no sign of her. When she appeared, some ten minutes later, she explained that she had been tracking the flight on-line and so had learned of my delayed departure which seemed to persist through out the flight, only to jump to the new arrival time when it was too late, plus getting stuck in her own traffic jam, on the M25. In her rush to leave home she had also forgotten the camera, so I just looked like an out of place Midnight Cowboy character. The benefit was that Angie’s delay resulted in the lowest airport car park charge that I can remember – just £3. Since returning home I’ve thrown myself into updating Google Earth with the GPS coordinates photographed on our SatNav at the start of each stop – when I remembered – and making a list of where I forgot, hoping that Alain was more conscientious in recording such stop info. It also appeared that I had ‘lost’ or ‘misplaced’ all images of 19 October, but I managed to find it in the ‘wrong’ location which happened as I was backing up all my images on to my HD as I was waiting to at the airport. I had thought that I might have had to wait until my new laptop charger had arrived (the original was left at T1, at Mexico International Airport), but fortunately the files had not been lost in transit. I’ve also given Angie a few viewings of what we saw, confirming that it will again be hard to select the best 400 images for 2015 presentations. And work has started on ‘The Cactus Trip Diaries – Mexico 2014 pt 2’, another Blurb self published work that I enjoy having as my own personal souvenir of each trip. As you can see, I’ve been busy enough to be almost unaware of the rain that has been steadily coming down since arriving in autumn sunshine on Sunday. Angie appears to have done a great job of looking after my Cacti & Succulent Plant Collection during my absence and we’ve been on shopping expedition to find suitable hangers for my ever growing collection of Stetsons / sombreros / etc. as I tend to buy one during each trip. 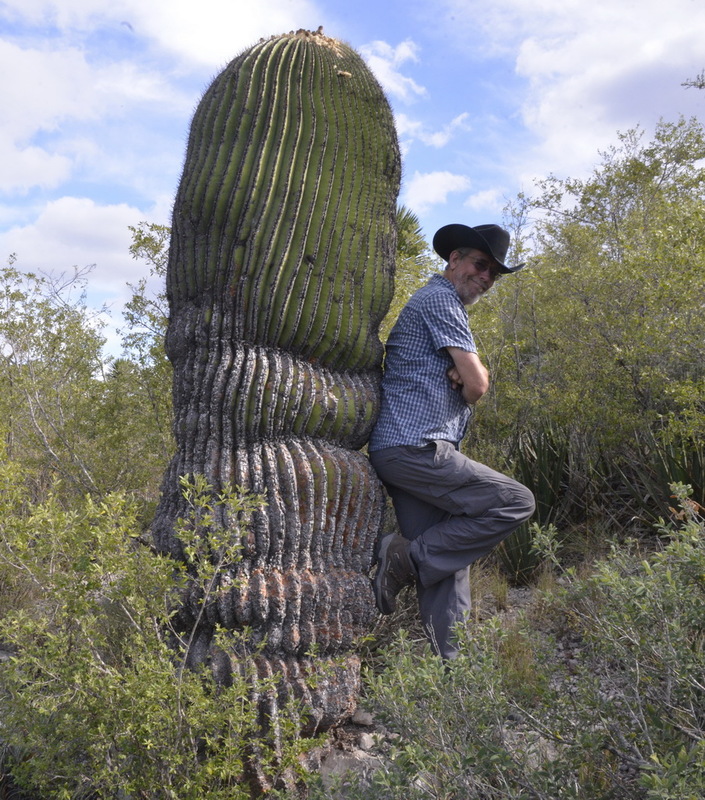 Plans are for a trip to give talks in California in February and for a trip back to Mexico, to explore for cacti in the states of Pueblo and Oaxaca in March 2015, a first for me, so each cactus seen will be a novelty for me. But first there are 10 days in Cologne at Angie’s Mum to look forward to, with visits to the Christmas Markets. We had plenty of time to complete our final packing, stroll around the streets some more and buy more small souvenirs to fill up the holes in my luggage. Bart felt fully recovered and, having done such a magnificent job getting us out of Mexico City on arrival, volunteered for the job as driver for the final journey to the Airport. Soon out of San Miguel de Allende we began to see first small- then larger groups of ‘Mexican Cowboys’ – I must find out what the term for people on horseback, probably involved in the cattle trade, is in Mexico. Gaucho’s? Anyway, there were hundreds, no thousands of them. Many of them were in festive dress, wearing very colourful clothes and their horses too were dressed for a fiesta! What was going on? Back in the UK, Alain had found an internet article about the ‘Cabalgata of Christ the King’, a tradition since 1927 when the Cristeros war started. The images on the ionternet certainly look identical of what we saw for many miles alongside the road. But the Cabalgata procession is said to take place 2 days before Epiphany so some 2 months after we saw our procession. Was it a rehearsal? Who knows. I had a shock being unable to find the images and movies that I had taken of the event, until Alain reminded me that as I had already packed my camera for the flight home, I used his camera to record the proceedings from the prime position of the front passenger seat. Driving back seemed a lot easier than the drive out of Mexico City as the road to the Airport was clearly marked and understood (Aeroporto T1) with a route that SatNav mostly agreed with. Common sense dictated that we’d follow SatNav where there were no signs but followed the signs, assumed to be more up to date than SatNav. We left San Miguel de Allende at noon and aimed to arrive at 16:00 for flights leaving around 23:00 hrs. We actually arrived at 16:30, due to slow traffic once we hit the Mexico DF border. The car was welcomed back by Hertz, it had served us very well indeed! We said our goodbyes, as Alain and Bart were due to leave from T1, where the Hertz return garage was based, while I hopped on the Airport train that took me back to T2, where we had originally arrived. I managed to drop off my hold luggage and then found a seat where I could clearly see the Departures board and opened up my laptop to start writing up the Holiday notes. The noticeboard suggested a departure time of 23:00, 40 minutes earlier than shown on my flight documents. My laptop ran out of power and I tried a local charging point that turned out to be disconnected. Then the notice board announced my departure gate, of course at the other end of the airport, so I quickly packed everything into my rucksack and legged it to Gate 68. nce I arrived back home I realised that my laptop charger was still at Mexico Airport and that a Microsoft replacement charger costs an eye-watering £65. Why so much? Never mind. We had a great trip and I plan to do it all again in 2015! When planning one of our trips it is important to plan for the unexpected – the flight home waits for no-one. In March 2014 we had scheduled our reserve day for an extra night at Vizarron. The hotel facilities suited us and their were interesting plants to see or re-visit a month after we had seen them on arrival. Walking around the town of San Miguel de Allende we agreed that this was a much nicer place to spend our last night in Mexico. 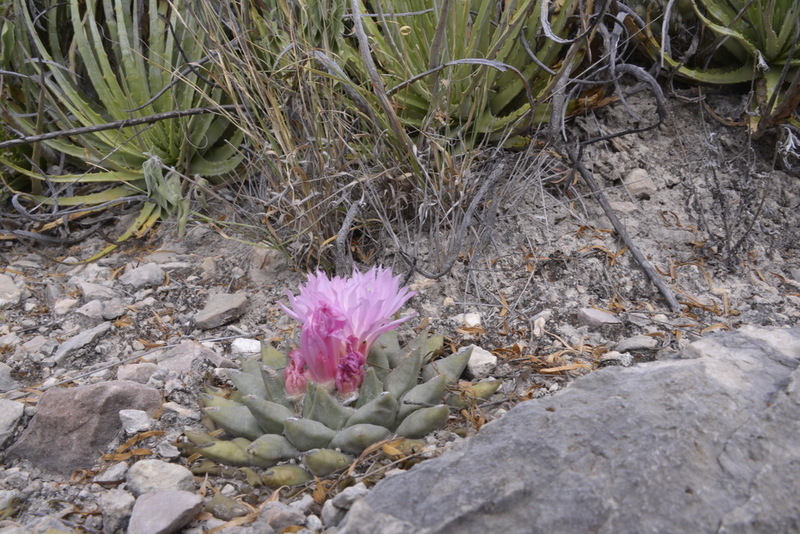 There were no interesting cacti reported from the area, sometimes due to the fact that there are none to be found, sometimes due to the lack of exploration by people travelling to or from Mexico International Airport, some 250 km away. Today we enjoyed more of a sight seeing holiday, with Alain and I enjoying gentle strolls through the town with regular ‘pit-stops’ at charming little cafe / restaurants, photographing streets and churches in the busy streets – it was surprising how many American and European languages we could hear around us and how many people working in the shops and eateries helpfully switched to good English when we tried out our improving Spenglish. Souvenirs were added to our luggage – I had spare weight allowance and bought yet another brightly coloured blanket that would add colour to some of the surfaces in my conservatory once the plants return to their outside spots when Spring returns next year. The huge Parroquia San Miguel Arcangel church dominates the Jardin Allende, a Plaza planted up with clipped ficus trees that provide shade for the people engaged in watching other people, moving on to the cafe restaurants around the square for refreshments or a main meal. And so our sightseeing became a bit of a pub crawl, with visits back to the near by hotel to check on a recovering Bart and to drop off our souvenir purchases. That night there was a parade on the Plaza with two or three giant puppets were followed around the centro of town, followed by a fully dressed up Mariachi band. Once the band returned to the square, they serenaded a couple with a small baby on the terrace of the restaurant where we had just finished dinner, providing the perfect opportunity to film their performance of two songs as a perfect ending to another trip. 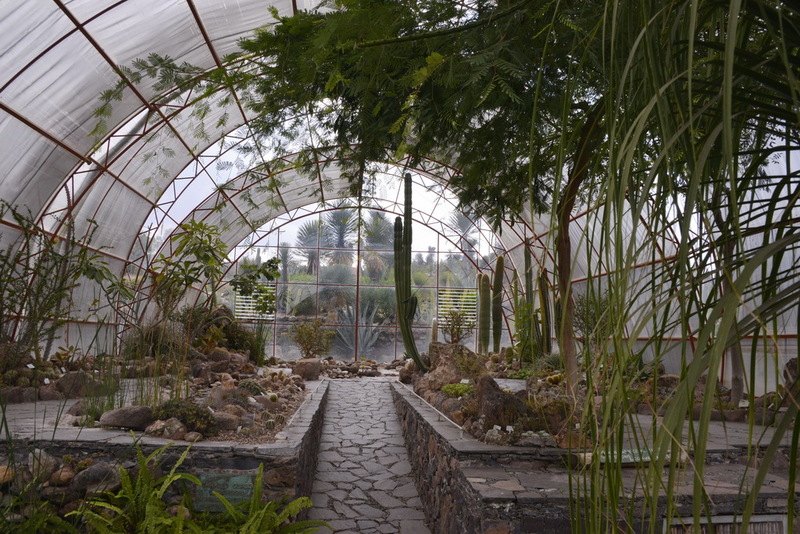 The ‘rolled up piza in a roll’ that we had last night had not agreed with Bart, who after several visits to the toilet and running a bit of a temperature decided to have a rest day, while Alain and I visited Xichu for a look at the Turbinicarpus alonsoi. The first images of the day were again a study in Topes, the humps and bumps that certainly don’t benefit travellers in cars with back problems. Here I focussed on the metal balls, half burried that cause a jarr to the back bone. 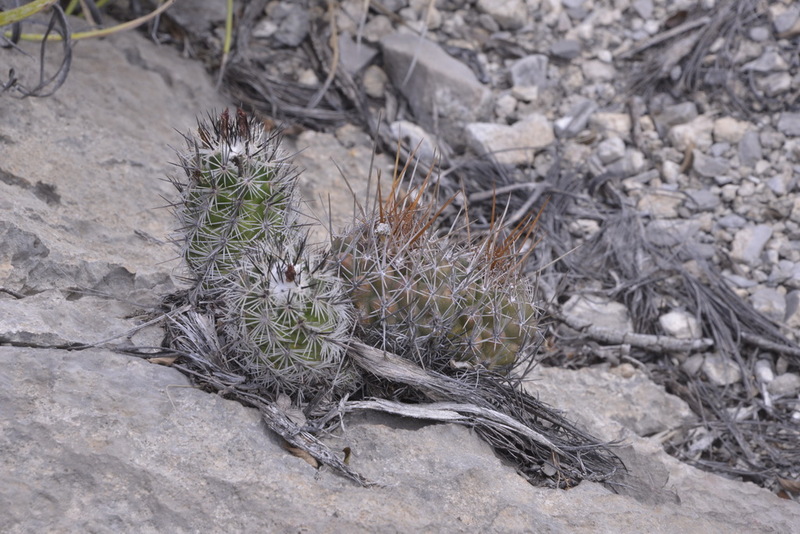 S3212 was a No Cactus stop in the Zona de Niebla in the Valle de Xichu, as I misjudged the next stop S3213, where we checked on the Mammillaria muehlenpfordtii seen here on previous occasions. They were still there, although I’m not sure for how much longer as rocks along the road seem to be ground down and used to build the roads and reinforce more formidable rock faces. There was a lot of evidence of rock fall during this trip – signs of regular minor earth quakes or of a reduction in the budgets to clear the roads from natural erosion? S3214 combined pictures of plants growing along the rock cutting as we drove out of Xichu towards the T. alonsoii. Here too the roadside rocks had been cut up to make space for concrete poles to cary elecytricity and / or telephony I assume. There certainly was not the variety of plants here that we had seen in March. Waling into the canyon where the plants grew it did not take long to find the first plants. They looked to have had a good year and were plumped up, but not in flower. On the opposite, shaded wall, there were mopre Mammillaria schiedeana than I remember seeing before – all small UK nursery seized , I do not recall seeing large plants in nature. These plants seem to live ion almost permanent shade, so don’t be fooled in giving these Mexican plants the full sun treatment in the UK. As we were about to to return to the car, Alain mentioned that we had company. As I looked in the direction indicated I saw a white somprero ducking behind the shrubs. I called out ‘Buenos dias, Senor’ but there was no reply. We carried on strolling back, taking pictures of plants spotted as we went. Near the canyon’s exit our Mexican frien reappeared and gave us a talk in much too fast Spanish for us to understand that we needed permission to be on this private land. We were surprised that this was private land as, unlike his land across the road, there were no fences or signs to indicate this. I said that in Europe where we came from unfenced land without signage was considered common land for all people to enjoy. We then said sorry. We left with a friendly hand shake, but heeded his comments that ther Policia or worse, vigilantes, might have caught us with dire consequenses. 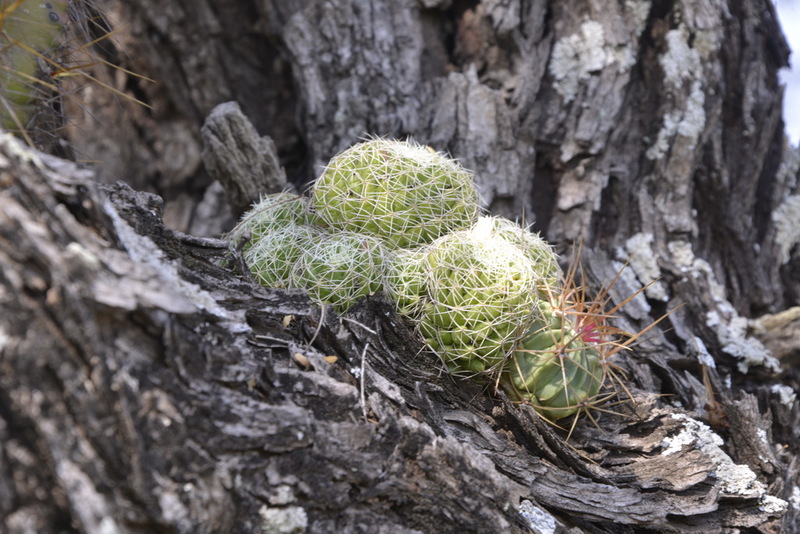 On the way back to San Jose Iturbide, Alain wanted to make a comfort stop and then called me over to take a look at a cactus growing behind the tree that he had selected for his privacy. 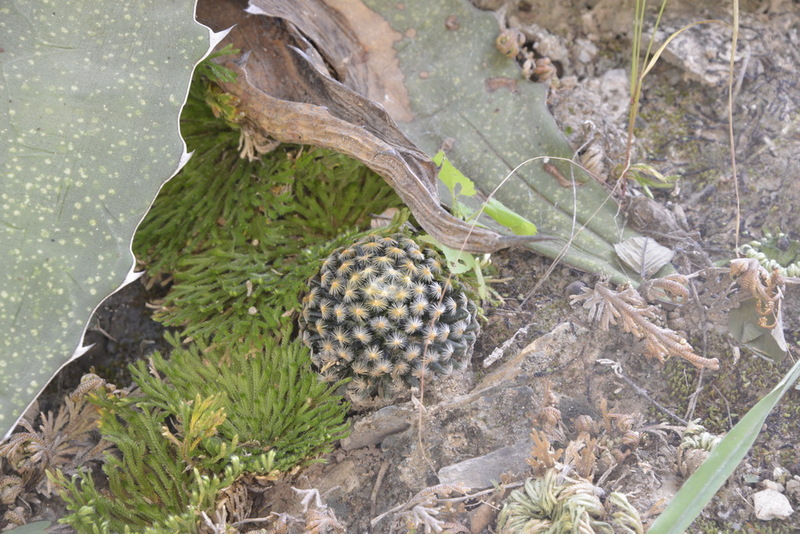 There on the ground was a cactus that I had been aware grew in this area but that we had never found: Ferocactus macrodiscus ssp. septentrionalis. It was certainly not a show plant by any means, but it was still nice top add another taxon to our species list of plants seen in nature. Where there is one, there should be more, so we took a stroll along the edge of the field across the road where Alain found another group of four, growing among and hidden by the tall grass. There were people working in the fields some distance away and remembering the words of the old man in Xichu we decided not to cross the new fence to do a bit of gardening to expose the plants. Alain had discovered a great restaurant at Hotel Los Arcos on the town square where the two of us enjoyed Marguaritas and Steak while Bart was well enough to join us for chicken soup. A great day! Not just because we were on the way home, slowly, but because 4.1 km from the hotel (the same one where we stayed in 2011 – the caretaker / owner was still drunk!) we completed our challenge of seeing every major taxon of Ariocarpus in flower, by finding A. agavoides (S3205). The plants would have been a real challenge to find if they had not been in flower! A couple of German cactus explorers were also staying in the hotel and as we stood on the hill, they must have seen our cars and parked behind us, climbing up as we were coming back. We told them the good news, that they were in the right place and that the flowers were waiting for them! 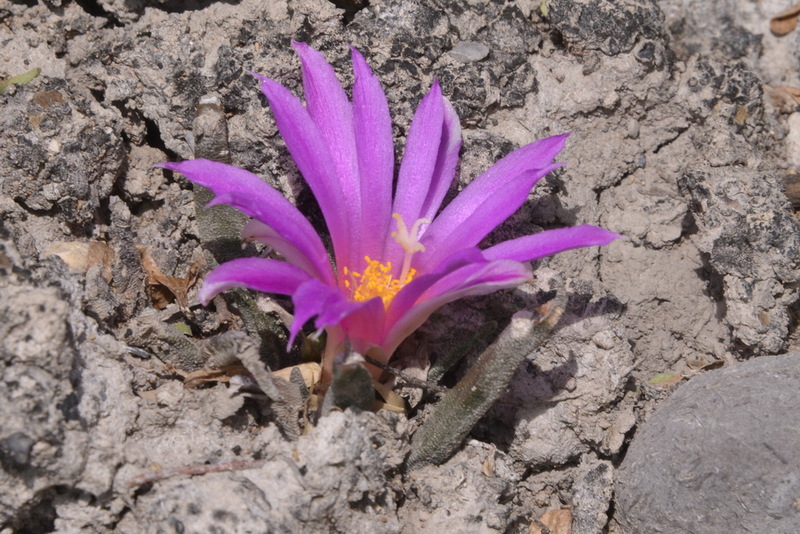 S3206 was a stop from last March and probably also from 2011 – it all seemed very familiar as we saw some lovely Astrophytum myriostigma, Thelocactus tulensis, Neolloydia conoidea, and of course an Ariocarpus, not in flower, so not sure if these were members of the confused A. confusus gang; the tubercles can be quite variable in retusus. We turned south for Palomas and Las Tablas and made a stop (S3207) to stretch our legs – we’ve rarely been disappointed making an ad-hoc stop along this road! S3207 was no exception. There were some nice Asdtrophytum myriostigma almost next to where Bart had parked the car. There are too many nice white spined Mams to know what we were looking at here – their appearance can vary depending on exposure to the sun or in a shady spot between Agave lechuguila, Hechtias and other things to tear at your ankles. I had wandered off in one direction and when I got back to the car, Bart & Alain asked, ‘Did you see the flowering Ariocarpus?’ No! and so we went back through the shrubs – everything has thorns or spines and is out to get you! The Arios here had big chunky tubercles and pink / purple / magenta coloured flowers – the confusion arises from people with different native languages describing colours, including me who is colour blind! We had a great time crawling all over the hill before returning to the car, with Alain finding another multi-headed Ariocarpus in full (19!!!) flower. We’ve christened this Super Ario, but you’ll have to wait a bit before I share this in my talks. We stayed again at Hotel Premier, where the wifi remembered us from previous visits after a reboot of the router and soon were off to Café La Granja where we have enjoyed excellent rib-eye steaks before, and again tonight, washed down with a bottle of Concha y Toro’s Seleccion, a blend of Cabernet Sauvignon and Merlot.